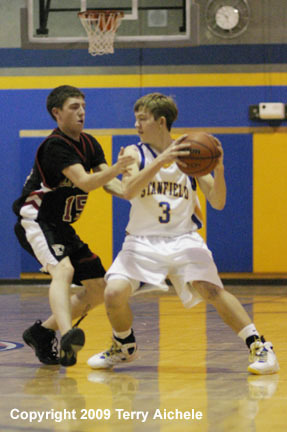 Stanfield defender Ryan Griffin, number 2, sets up against Tyler Warner. 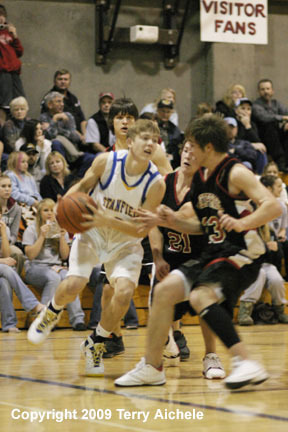 STANFIELD - The Stanfield Tigers and Enterprise Outlaws, both 3-2 in conference, met in Stanfield on Saturday, January 17, 2009. 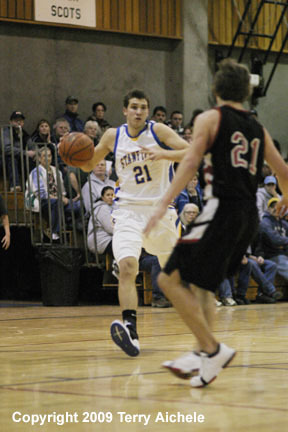 In an exciting and hotly contested game Stanfield won 68-62. Stanfield led through most of the first period. Stanfield had good play in the first period by several players including Chase Erwert, Tyler Hawkins, Robbie Shirley, Stephen Whelan, and Omar Ibarra. The Outlaws closed in 12-13 at the 1:45 mark on a shot by Dusty Mcauliffe. Then the Outlaws took the 14-13 lead on a steal and layup by Mcauliffe. The lead was exchanged until the period ended with the Outlaws leading 18-16. The Tigers took the early lead in the opening minutes of the second period. Stanfield stretched to a five point lead 27-22 at the 4:38 mark of the period. 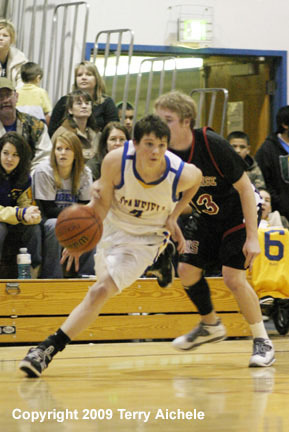 Then Enterprise, with the help of Matt Fisher, started their scoring machine tieing it up at 27 all. Then the Tigers came back for a 31-27 lead. Then the Tigers went cold with a minute to go in the first half. The Outlaws scored six points to take a 33-31 lead at halftime. Hector Esquivel of Stanfield hit a three pointer in the first minute to give the Tigers the 34-33 lead. The Outlaws tied it up a couple times at 37 all and 40 all. Then Stanfield held the Outlaws scoreless for over five minutes. Along with Esquivel, other Tigers scoring in the third include Hawkins, Whelan, Kameron Watson, Quin Grogan, and Chase Erwert. Stanfield led at the end of the third period 51-42. The Outlaws shot their way back into the game during the fourth period tieing it up at 57 with 4:32 to go in the game. 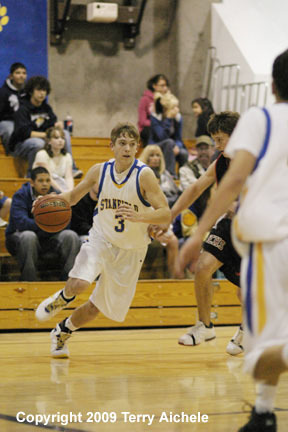 That was the last time the Outlaws challenged Stanfield for the lead. 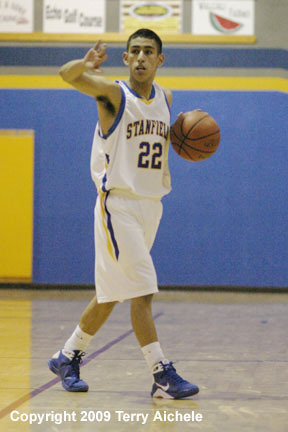 From that point on Stanfield took control of the game and won with the final score of 68-62. LEFT - Stanfield Tiger Robbie Shirley reacts to an Enterprise defender. 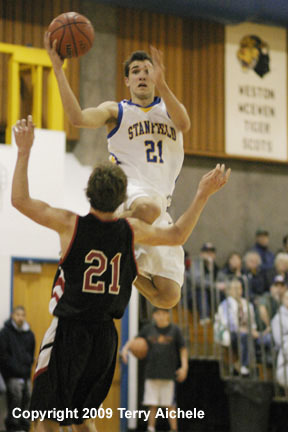 RIGHT - Robbie Shirley of Stanfield takes to the air on his drive to the basket. 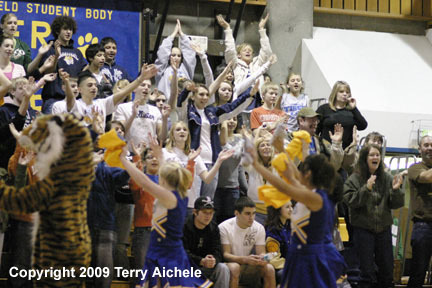 LEFT - Stanfield fans show their support for the Tigers. RIGHT - Robbie Shirley of Stanfield eyes the Enterprise defender as he plans his next move. 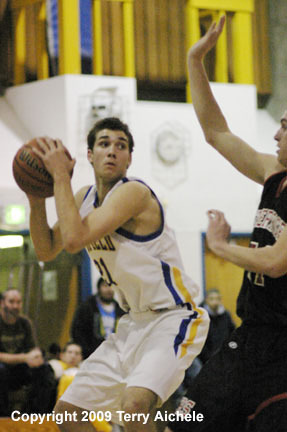 LEFT - Quin Grogan of Stanfield speeds around an Enterprise defender while on his way to the basket. RIGHT - Tiger Hector Esquivel motions to a teammate in preparation of starting a play.